Q. What is the best way to reduce bleed on a drum recording? When mixing drums, is it standard practice to try and tighten things up by getting rid of bleed on all but the overheads? I'm guessing it's genre specific. At the moment I'm recording mainly rock and indie‑style music and just wondered what the pros and cons of doing this are? Also, besides manually going through and silencing or reducing the level of bleed on these tracks, are there any better ways of doing it? 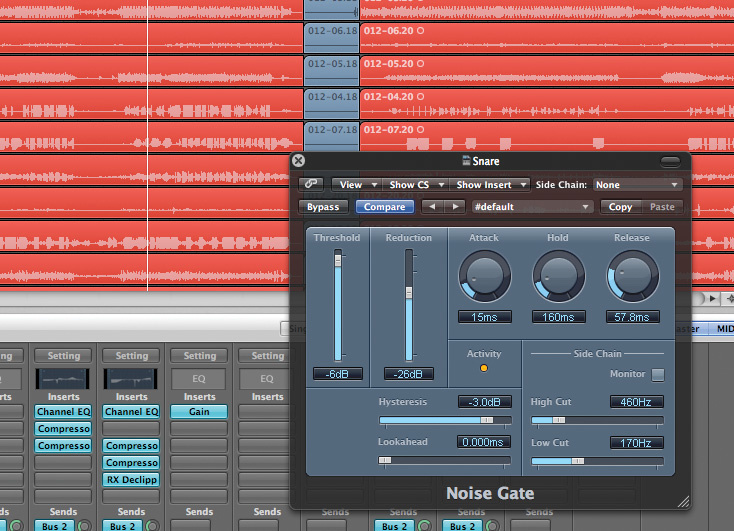 I've tried noise gates but to get them at the level of noise reduction I need, they stifle the actual drum hits. I'm using Apple Logic 8. 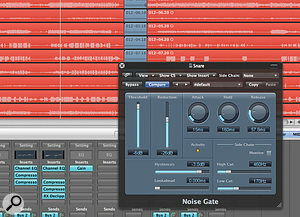 Logic's Noise Gate plug‑in's side‑chain filtering and range (Reduction) control make it useful for processing drum recordings to reduce spill. SOS contributor Mike Senior replies: While there are a lot of ways to reduce bleed levels on close mics, and you'll often see some kind of spill‑reduction processing in mixes of multitrack drum recordings, I'd advise against trying to remove all the spill from them. Even if you could actually pull it off effectively, you'd almost certainly throw out the baby with the bathwater in the process, as the spill contributions can actually improve your complete kit sound by picking up more aspects of each instrument and by generally gluing everything together. It's much better to build a kit balance from the mics without processing (although you should pay adequate attention to the polarity settings on each of the tracks, as with any multi‑mic recording) and then only bring in spill‑reduction processing where it's needed. For example, it's not uncommon for there to be too much hi‑hat in the balance if the snare mic has picked up lots of hi‑hat spill, so that would be an argument for trying to reduce this bleed — not killing it completely, necessarily, just pulling it down enough to sort out the balance problem. Similarly, if your tom‑tom close mics are over‑emphasising the sympathetic ringing of these drums (a common problem), some reduction in the spill on those mics would probably be in order. In terms of techniques, there are a lot of ways to deal with spill, but the primary way is via dynamics processing such as gating/expansion. It's useful that Logic's built‑in Noise Gate plug‑in has side‑chain filtering, so that you can achieve reliable triggering, and that it offers range control, which lets you reduce spill without completely muting it. Both of these facilities make life a lot easier. Some people also just use manual audio editing to deal with spill sections, but that can quickly get very laborious on anything but rarely used tom‑tom tracks. If you've got a complicated part and are really having trouble getting a gate to trigger properly, try automating the gate's threshold control for any problem sections. Reading between the lines of your question, it sounds to me as if you might have a really tough spill problem to deal with, by nature of some problem with the recording. If you've got overwhelming levels of hat spill on your snare close mic, probably the best salvage technique I can recommend is to trigger a snare sample of some type from the close‑mic track. Much of the trouble people get with hi‑hat spill is on account of heavily EQ'ing the snare mic to brighten it, so layering in a bright (and even high‑pass filtered) sample instead may solve the problem, by obviating the need for the EQ. You could also just completely replace the close mic with the sample, of course, but it can sometimes then be difficult to blend the sample convincingly with the kit, so try just blending first.